The BPA suite focuses primarily on business process documentation, capturing of requirements, gap analysis and blueprinting of SOA. The integration of BPA tools can accelerate project realizations by use of existing BPM assets, by spreading the work of process mapping to business lines and analysts or by handing over model deliverables in the very common format of Microsoft Visio. This allows also publishing into SharePoint. 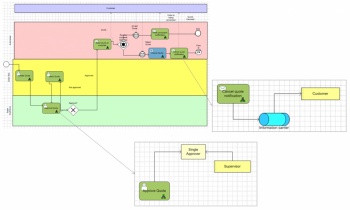 Export of an Oracle BPA business architecture with models to Visio or other modeling tools. The conversion of legacy Visio diagrams or models from other tools is supported by transforming even very deviant conventions into valid Oracle BPA conventions. The following videos show the migration of model data to Oracle BPA conventions. The Oracle BPA Suite uses an adapted modeling language that has similarities to the ARIS modeling language. A functional allocation diagram (FAD) e.g. 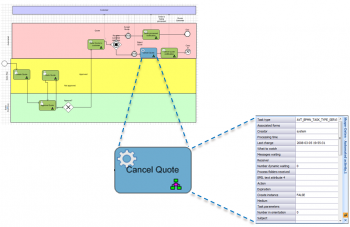 describes the context of a BPMN task and the same applies to the EPC modeling language. 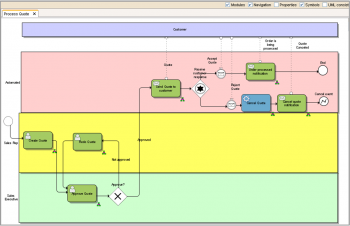 The demanding adaption requires a customized BPMN modeling language which the BPM-X tool provides with its modeling language template library. Provided standard conventions can be modified for the custom Oracle BPA filter used by the organization. The BPM-X Designer tool for Visio loads these conventions into a configuration file and thus allows method compliant and high quality modeling of deliverables created in Visio. Besides the conversion of diagram graphics, the model and object data are bidirectionally exchanged between the tools. The conventions of the Oracle BPA filter are adapted so that all data are available in the Visio tool. With the capability of BPM-X to convert model data an many formats, a cool feature is to publish into SharePoint. Different formats can be used like HTML5 or the new Visio 2013 VSDX format. By using VSDX format we can use SharePoint 2013 Visio Services to build dashboards visualizing KPIs in process models using Visio Data Graphics. At the bottom line, BPM-X offers a valuable support for Oracle BPA Suite with its set of templates and configurations. Existing diagrams can be leveraged for the import into the BPA Suite assuring a fast project start. Project productivity can be significantly boosted by using Visio with the BPM-X Designer tool as an easy to use front-end modeling tool for consultants, business analysts or process owners.